Established In 2002, Power Works brings together more than 40 years of experience in cable engineering and construction works. All four partners have made their mark as leading cable contractors over the years. Power Works is backed by the excellent reputation of four companies, all of which have proven records of successfully completing all cable installation projects awards to them. Related Engineering works and services. 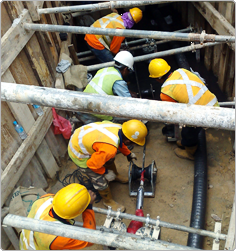 When it is not possible to use open cut trenching to construct duct block for cable installation, an alternative solution will be the use of pipe jacking. Â© 2014 Power works Pte Ltd. All rights reserved.